California State University and its Multimedia Educational Resource for Learning and Online Teaching program are working to make open educational resources available for workforce training. SkillsCommons offers 6,000-plus OER resources focused on workforce training, including complete course content and program support materials. The U.S. Department of Labor has invested almost $2 billion over the last four years in its Trade Adjustment Assistance Community College and Career Training (TAACCCT) grants. These grants are intended to help community colleges and other eligible institutions of higher education build up programs for delivering training that can be completed in two years or less by workers pursuing employment in high-wage, high-skill occupations. Currently, 256 institutions participate in TAACCCT. The results of their efforts are turned into Creative Commons materials that can be freely used by others in their own education programs. These are available through the online site SkillsCommons — developed and maintained by the California State University, a bastion of the open educational resource (OER) movement. Recently, the university system heard from the federal agency that it would be able to continue that work, handled by the CSU Office of the Chancellor and its Multimedia Educational Resource for Learning and Online Teaching (MERLOT) program. 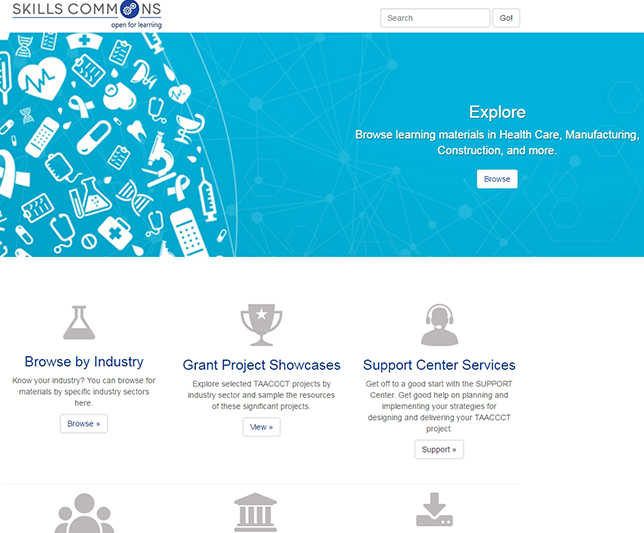 Right now, SkillsCommons has 6,000 OER resources, with more coming in all the time. Those include complete course content and program support materials. The resources are available for use by any workforce training program sponsored by K–12 schools and four-year universities. So far, participants have developed or revised 2,300 programs of study, according to CSU. "The CSU is honored to produce this open educational service to support free access to innovative workforce development resources," noted Gerry Hanley, assistant vice chancellor of academic technology services and the executive director of MERLOT, in a prepared statement. "It is another testament to the CSU's nationwide reputation for leadership in OER and MERLOT's worldwide network of peer-reviewed materials." The collection is available on the SkillsCommons website.